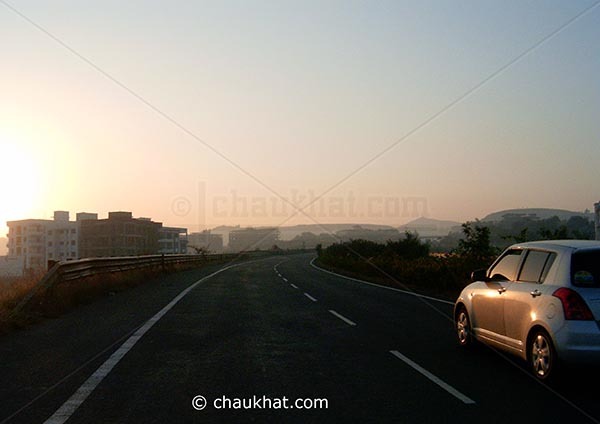 It was about 6:30 in the morning and a drive on the new Mumbai-Bangalore bypass. The morning sun was perfect for a good photo. I took this photo of morning road about 4 years back! Early morning photo looks to be fabulous. A must have picture. beautiful... makes me feel like i'm on the road.. It has a FEEL of morning! That's very hard to capture! I can feel the morning in this picture. It's lovely - a nice time to be driving and there are no people on the road! Unusual for India, no? How long a drive is it with this new bypass? @ RNSANE: Yes, unusual for India. But when I took the photo, the Mumbai-Bangalore bypass was newly built, and many didn't know about it probably. Probably, the bypass is 10 kms long. But the actual distance between Mumbai and Bangalore is about 1000 kilometers [about 625 miles]. The bypass is actually a faster alternative to the old portion of road that went from a hill called Katraj. When you come here, I will take you there.